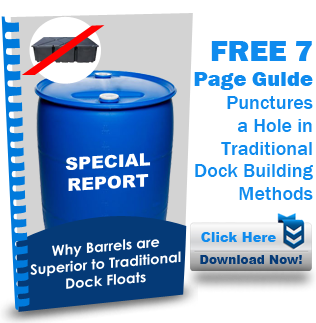 This 24×8′ floating dock has heavy duty plastic wheels that allow it to be rolled up the bank. Also included is a 20×4′ feee spanning gangway. The kit was shipped with everything except the barrels. “Phil: Dock + boat went in the water a couple weeks ago. I am 100% satisfied with with the dock. The engineering was great, everything fit without alteration, and the assembly instructions worked exactly as described. Turns out the river bottom is rock which I didn’t feel I could get posts deep enough into to hold the dock against some of the current we get in the maumee river. My solution , as shown in the pics, was steel reinforced plates on both ends attached to 6×6 posts on the bank at 2 positions on each end with galvanized pipe, chains and clips. This system should make it easier for removal and instalation of the dock in winter and spring.